Home » News » April Newsletter – How to Pack a Moving Truck, Easy Baby Shower Ideas and MORE! April Newsletter – How to Pack a Moving Truck, Easy Baby Shower Ideas and MORE! 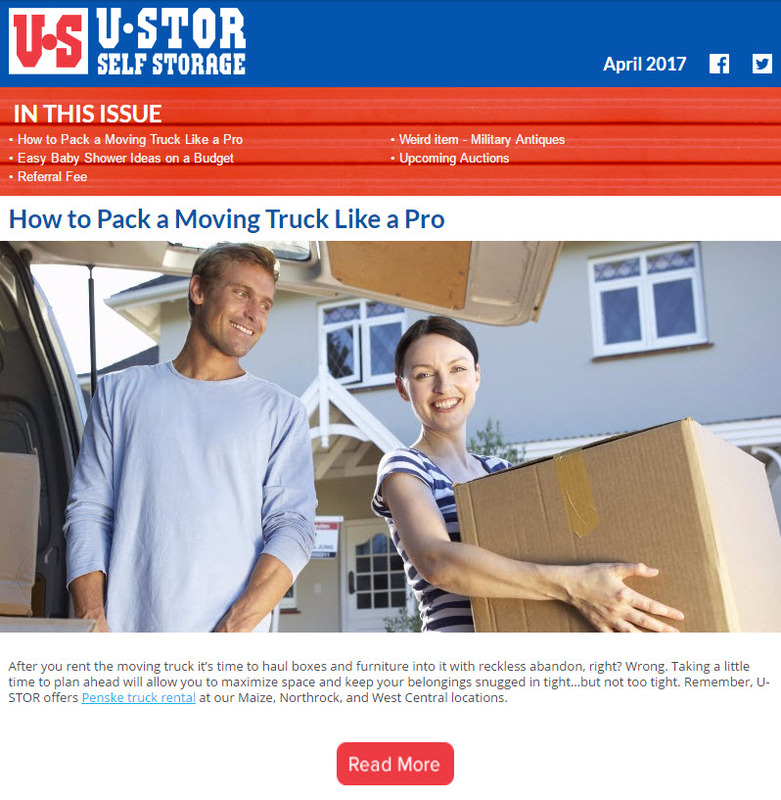 In each issue of the U-Stor newsletter, we provide readers with helpful information they can use in their daily lives. We also reveal auction times, coupons/specials, and share the many weird items people have found in storage units over the years. How to Pack a Moving Truck like a Pro – After you rent the moving truck it’s time to haul boxes and furniture into it with reckless abandon, right? Wrong. Taking a little time to plan ahead will allow you to maximize space and keep your belongings snugged in tight…but not too tight. Easy Baby Shower Ideas on a Budget – Is planning a baby shower in your future? We’ve got some easy, budget-friendly ideas for making you the best hostess EVER!Don’t stress! We’re here to help. Tell a Friend discount – Tell a friend or family member about U-Stor. If they become a tenant, you get cold hard cash! Upcoming Auctions – At least twice a month we hold auctions at one or all of our seven U-Stor locations. Auctions are silent bid only. Follow us on Facebook to find out when storage units are available for preview. Open the newsletter to find dates and locations. Weird item of the month – Hint: Stand at attention for this one, soldier.